Grand Bayonne and Petit Bayonne are separated by the River Nive, and both are interesting to explore. Most of the sites of Bayonne can be easily visited on foot. The beautiful Cathédrale Ste-Marie, with its soaring towers, dominates the skyline. 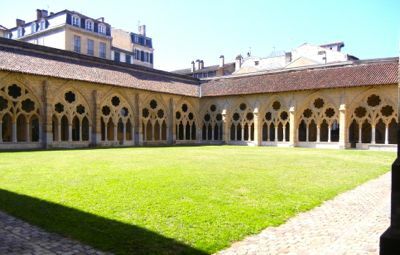 Built in Gothic style from the 13th to the 16th centuries, the cathedral today is an inviting site right in the heart of Grand Bayonne. The beautiful cloisters provide a peaceful spot with lovely views. The Château-Vieux or old fort dates from the 12th century. Although it's not open to visitors, you can view the exterior. 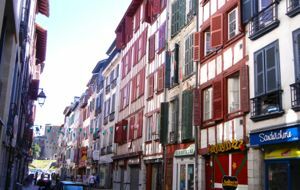 Bayonne has a number of museums, including the Musée Basque. This museum has important ethnographic collections about the history and culture of the Basque people and region. Chocolate making has been important in Bayonne since the 17th century, when sailors brought back the ingredients from the new world. Today there are a number of chocolate manufacturers, and you can visit the Atelier du Chocolat to learn about the history of chocolate. Check at the Tourist Information Office for specifics. On the food theme, Bayonne is also known for its ham, called jambon de Bayonne, and if you're interested you can visit a ham salting and drying facility. Whether you do that or not, be sure to taste some of the delicious ham at the market or in a restaurant. The Botanical Garden, near the Tourist Information Office, has 1000 species or varieties of plants, displayed in a Japanese style. Nearby is the Jardin Publique, or Public Garden, with its beautiful plantings. The Jardin Publique fronts on the Adour, just before it splits into the Adour and the smaller Nive. The Halles, or public market, is on the quais of the Nive, on the Grand Bayonne side. Numerous small bridges cross the Nive to Petit Bayonne, with its narrow streets and old buildings. Bayonne is also known for its long history of bull fights. In July or August, the Fêtes de Bayonne provide a range of entertainment, from music to dance to sports to corridas. Above, Colorful buildings of Petit Bayonne, France. 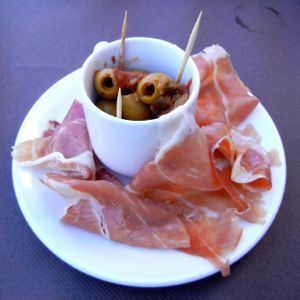 Below, An amuse-gueule (little appetizer to amuse your face) of jambon de Bayonne.